Some quests are fun, but challenging. This one is exactly that kind of quest! Deliver all items to their destination points by clicking on the plates. 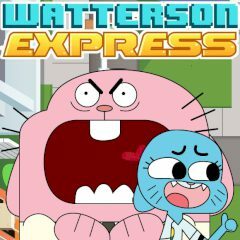 Gumball Watterson Express is a game about making quick decisions that should be correct. There are several destinations displayed at four corners of the screen. You should deliver the correct item to every place. Make no mistakes and complete the level with green health bar!